Mamagoto’s tagline ‘fun Asian eating’ couldn’t have been more apt. 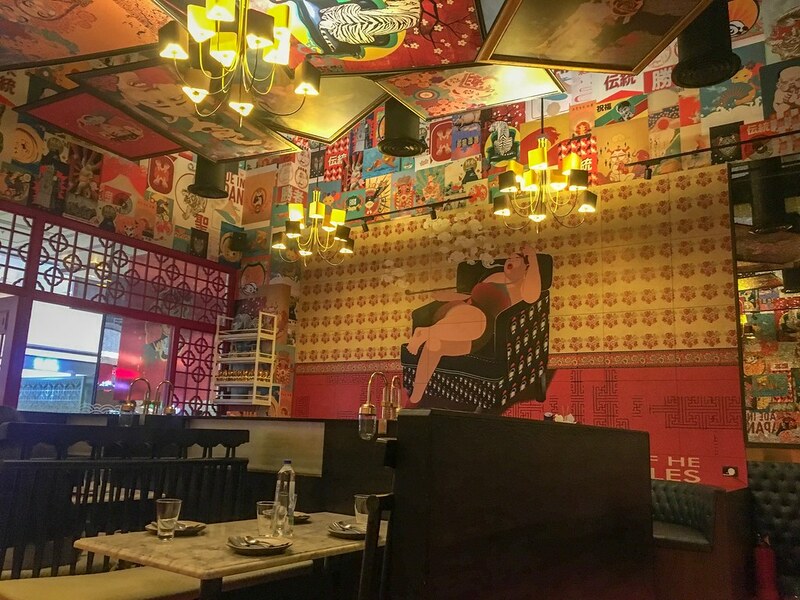 With a bright decor featuring a collage of hip and quirky East Asian elements and a casual laidback vibe, Mamagoto ­ — a new entrant among the restaurants serving Asian cuisine in Pune — is sure to make your dining experience a lot more fun and enjoyable. Mamagoto, literally meaning ‘to play with food,’ is, as the owners say, ‘not authentic Asian food’ but the restaurant’s take on popular home and street food from the region. In the name of fusion food, a lot of eateries are mixing up cultures and continents without giving it a second thought but Mamagoto has hit the mark by keeping it simple and delicious. After going through the extensive menu of soups, salads and starters, exhausted and unable to decide, we asked for recommendations. The staff readily agreed and after asking our preferences, suggested Chicken Basil Cups and Pak Choi wrapped Chicken Dumplings. For drinks, we had Passion Fruit and Orange Cooler and Blueberry Pop Rock. My Blueberry Pop Rock with a paper straw! The drinks came first and were pretty looking and delicious. Passion Fruit and Orange Cooler, thankfully, wasn’t sugary and had the perfect citrusy zest. Blueberry Pop Rock was a sophisticated barf-ka-gola which was flavoursome. Shortly, our starters arrived. Chicken Basil Cups were an absolute treat. 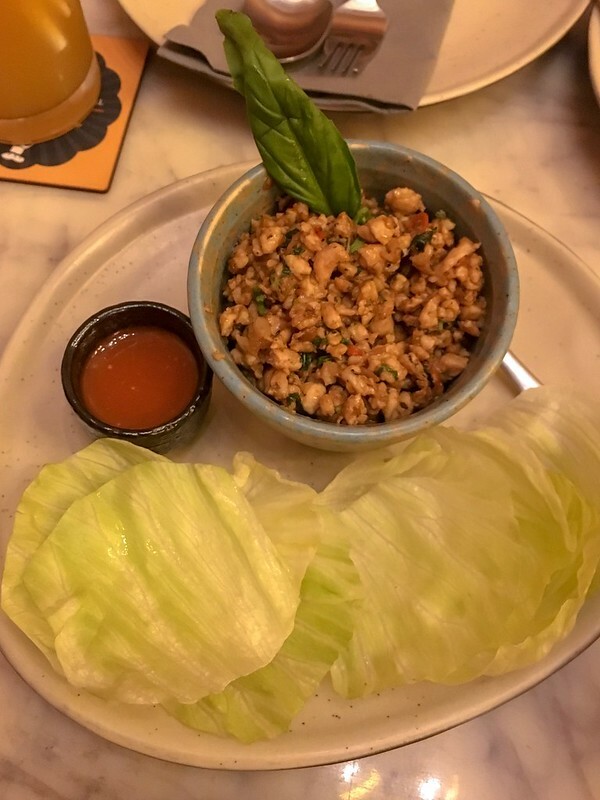 Small pieces of chicken cooked in basil was served along with little round bite-sized pieces of lettuce. One has to stuff the chicken in the lettuce, wrap it and take a mouthful. Along with tiny drops of hot sauce inside, they tasted heavenly. For me, dumplings always meant fillings wrapped in flour but these dumplings were wrapped in pak choi — a cabbage mainly used in Chinese/ Oriental cuisine. Served along with four different types of sauces — schezwan and soy among the four — the chicken, which was perfectly cooked, tasted awesome. The sauces provided a lot of flavour to the dumplings. Though we ordered non-vegetarian starters, there are plenty of vegetarian options too like Vegetable Basil Cups, Cheesy Tacos, Spring Rolls and so on. I really wanted to try Thai Puchka Bite and I will be going back soon to try it. Moving on to the main course, if you are visiting the place with a group of people, we highly recommend Mamagoto’s Signature Bowls. There are plenty of options for vegetarians as well as non-vegetarians, and the portion served is enough for a couple to comfortably share. We ordered Spicy Bangkok Bowl, Mamagoto Goreng and Chiang Mai Train Station Noodles. All the dishes were distinctive in taste and equally delectable. Spicy Bangkok Bowl with vegetables cooked in fresh Thai spices and herbs was flavoursome and not very spicy as the name suggests. 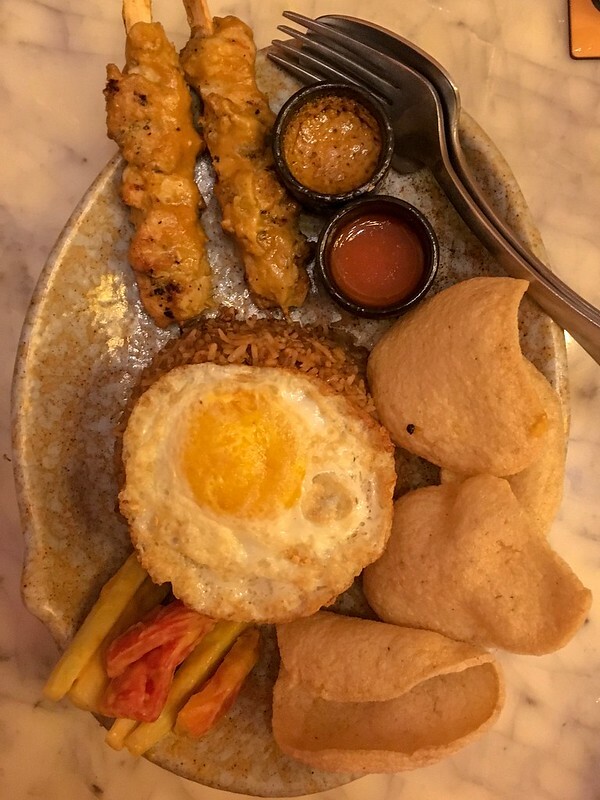 Mamagoto Goreng is Mama’s take on the classic Indonesian rice — Nasi Goreng. The Mama’s version is served with Chicken Satay and is a bit tangier and spicier than the original but tastes good. The rice is also served with Prawn Poppadom and sauces and one does not need a curry to go along with it. My favourite of the three was the Chiang Mai Train Station Noodles. 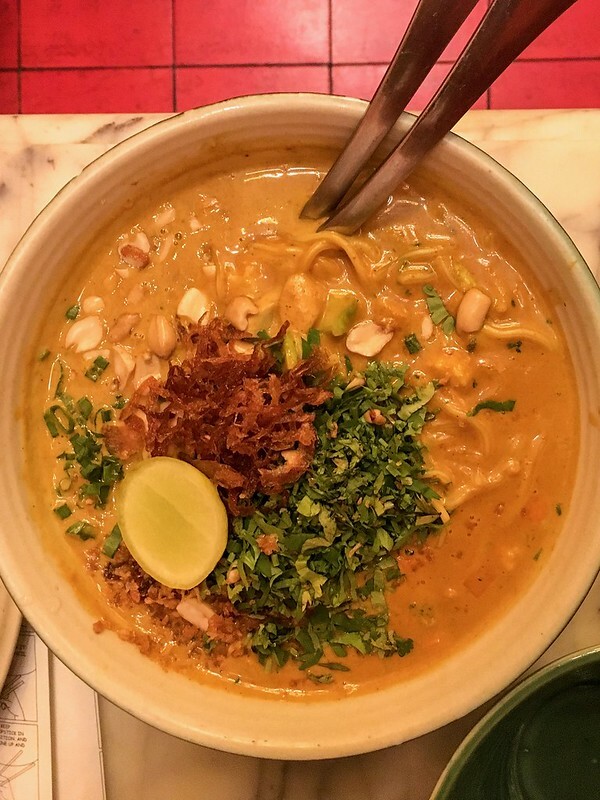 Thai cuisine has a lot of coconut flavour in it and the noodles with coconut milk curry had the perfect blend of coconut milk and spices, and tasted a lot like Burmese Khow-suey. Mamagoto also has a Wok menu and a Sushi menu. The Chiang Mai Train Station Noodles are to die for! After contemplating for sometime whether to order desserts or not, we finally asked for some Mama’s Banana Split. The bananas deep fried in coating of toasted coconut and panko — to give it crispiness — was served with salted caramel sauce and vanilla ice cream. The ice cream balanced the flavour of coconut and banana superbly and was a delicious end to our fun meal. 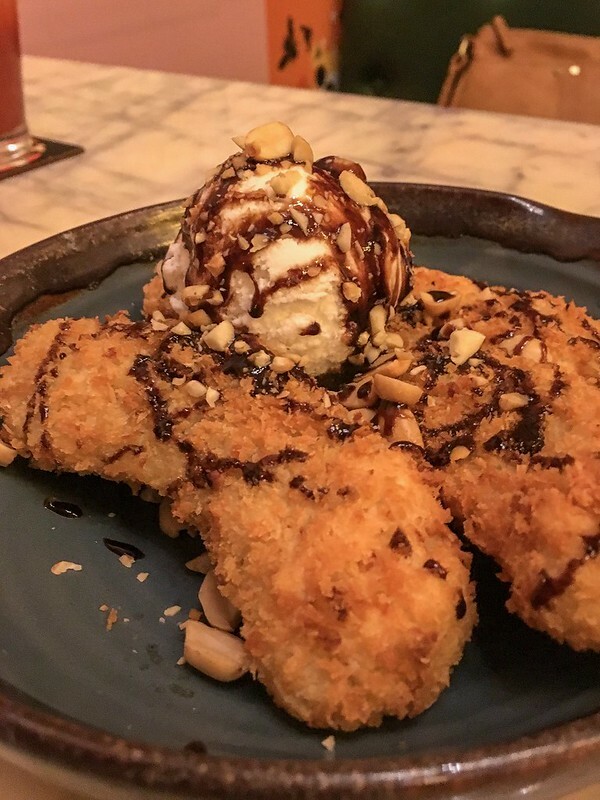 Mama’s Banana Split – delicious fried banana with ice-cream! 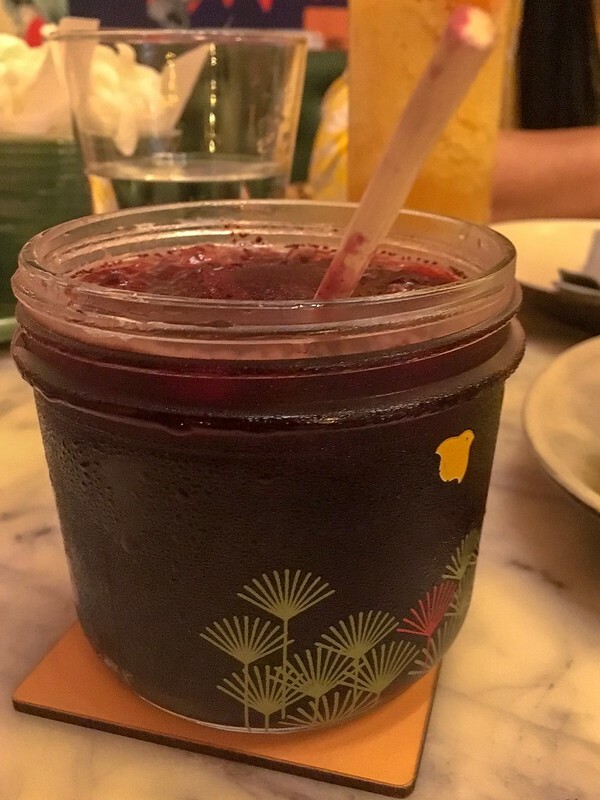 Posted in Food LoveTagged asian cuisine, asian food pune, mamagoto, mamagoto pune, pune food, pune food bloggers, pune restaurants, restaurant reviewBookmark the permalink.